Bush was the nation's 41st president, vice president, CIA director, ambassador to the United Nations, U.S. envoy to China, a member of Congress and father of the 43rd president. George H. W. Bush, the 41st president of the United States. George Herbert Walker Bush, the patriarch of a storied political family of Texas and the United States, has died, a family spokesman said Friday night. He was 94. Bush, a Republican, was the nation’s 41st president and served as vice president, director of the CIA, ambassador to the United Nations, U.S. envoy to China and as a member of Congress after a successful career in the oil business in Texas. The son of a U.S. senator, Bush and his wife, Barbara, who died April 17, spawned a family of politicians. His eldest son, George W. Bush, served two terms as the 43rd U.S. president after a term-and-a-half as governor of Texas. Another son, Jeb, was governor of Florida and sought the GOP nomination for president in 2016, falling short in primary and caucus voting despite overwhelming fundraising success. Jeb’s son, George P. Bush, was elected land commissioner of Texas in 2014. "Jeb, Neil, Marvin, Doro, and I are saddened to announce that after 94 remarkable years, our dear Dad has died," former President George W. Bush said in a family announcement. "George H. W. Bush was a man of the highest character and the best dad a son or daughter could ask for. The entire Bush family is deeply grateful for 41’s life and love, for the compassion of those who have cared and prayed for Dad, and for the condolences of our friends and fellow citizens." George H.W. Bush was born in Massachusetts in 1924. He was a Navy aviator in World War II, the pilot of a plane shot down during a bombing run in the Pacific. After the war, he and his family moved to Midland and later to Houston, where he worked in the oil business before his interest in politics was sparked in 1964 as chairman of the Harris County Republican Party. He ran for U.S. Senate and lost that year, but he won a seat in Congress two years later and became the first Houston Republican in the U.S. House. He won a second term in 1968 and gave that up for an unsuccessful run for U.S. Senate in 1970; he lost to Democrat Lloyd Bentsen, who went on to hold the seat for 22 years. Bush ran for the Republican presidential nomination in 1980, representing the GOP’s centrist wing in a primary where conservatives lined up behind Ronald Reagan of California. Bush won in Iowa, but Reagan rebooted and won in New Hampshire and the states that followed. Reagan selected Bush as his running mate at the 1980 Republican National Convention. Bush won the party’s 1988 presidential nomination after he lost the Iowa caucuses, finishing behind U.S. Sen. Bob Dole and Pat Robertson, a television evangelist. He named Dan Quayle, an Indiana senator, as his running mate, and beat Democrat Michael Dukakis in that year’s presidential race. Bush raised taxes in a deal with Congress designed to reduce the federal deficit, breaking a famous campaign promise: “Read my lips: No new taxes.” He started a volunteer movement — 1,000 Points of Light — that grew into a foundation that continues to promote volunteerism in the country. He named Clarence Thomas and David Souter to the U.S. Supreme Court. He authorized “Operation Just Cause,” the military invasion that removed Manuel Noriega from power in Panama. And in early 1991, he sent U.S. troops to the Middle East as part of an international coalition that successfully opposed Iraq’s invasion of Kuwait. Bush also spearheaded the North American Free Trade Agreement, or NAFTA, which regulated trade and shrunk tariffs among the United States, Canada and Mexico. That was adopted in 1993, after he left office. 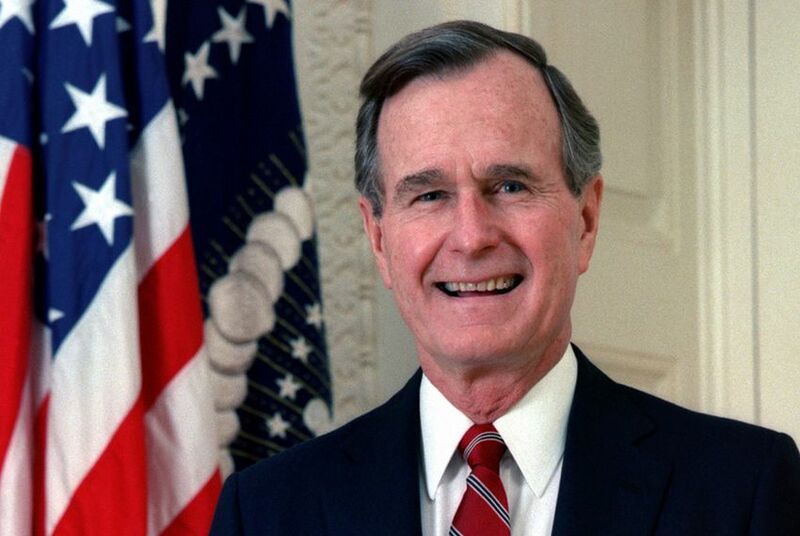 Bush lost his 1992 re-election bid to Arkansas Gov. Bill Clinton in a three-way race that also included Dallas billionaire H. Ross Perot. The loss was attributed in part to a soft economy and to conservative unhappiness with Bush’s broken promise on taxes. George and Barbara Bush retired to Houston. His presidential library, next to Texas A&M University in College Station, was dedicated in 1997, and the government school there is named the George Bush School of Government and Public Service in his honor. Disclosure: Texas A&M University has been a financial supporter of The Texas Tribune. A complete list of Tribune donors and sponsors can be viewed here. Editor's note: An earlier version of this story put Dan Quayle in the wrong state; he represented Indiana in the U.S. Senate.